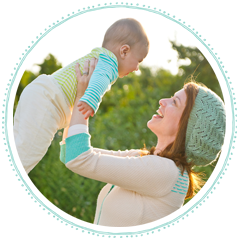 I'm sure I've mentioned numerous times in my other posts that I'm a big fan of Nuna products. I think the Nuna Pipa car seat is one of the best infant car seats on the market, I'm absolutely in LOVE with the Nuna Leaf baby lounger and the Nuna Sena Playpen/Travel Crib is a life saver! 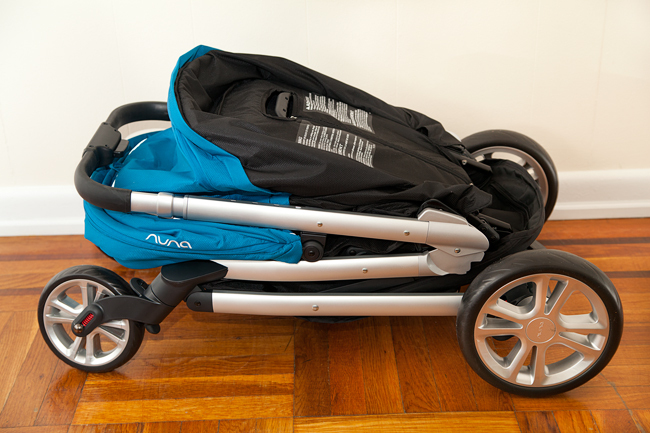 I recently reviewed the Nuna MIXX full featured stroller and now I'm absolutely thrilled to get my hands on the Nuna Tavo, the newest stroller from the Dutch-designed brand. At first glance, the Tavo very much resembles the Nun MIXX, with the most obvious difference being in the seat. 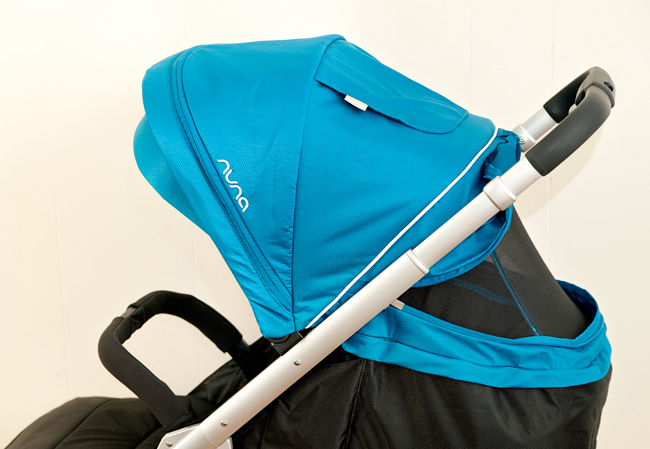 The MIXX has a reversible seat unit, while the Tavo is a fixed, forward facing seat. 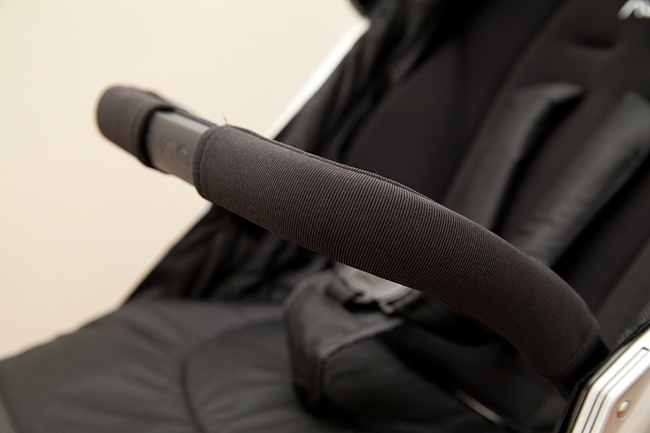 However, the Tavo seat does recline completely flat, making it suitable for newborns. 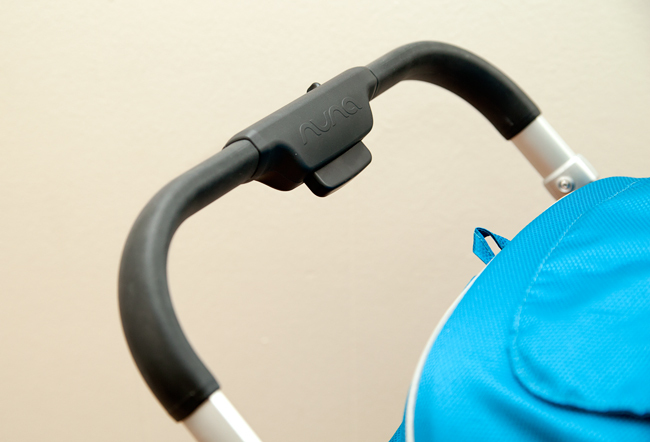 Tavo was also designed to function as a travel system with the Nuna Pipa car seat, which clicks right into the stroller without the need for adapters. 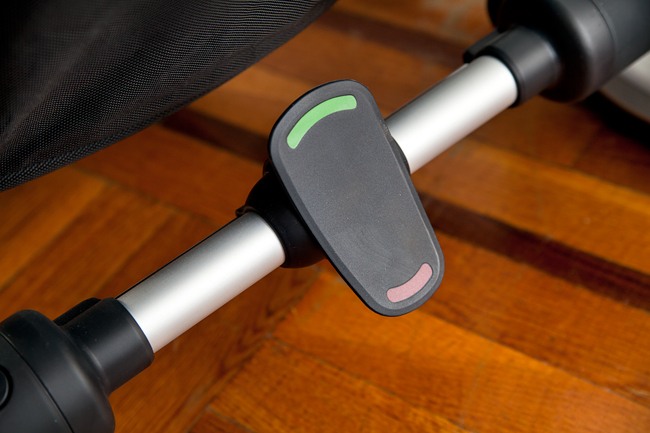 Lifting the car seat from the stroller is super easy, due to it's one-hand release lever. Don't think though, that the Tavo is just a smaller version of the MIXX. I think it is a phenomenal stroller in it's own right, with some improvements and features that are not on the MIXX. Nuna Tavo is Available in 4 canopy color variations. It retails for $350, which is very affordable, considering the many awesome features packed into this stroller. 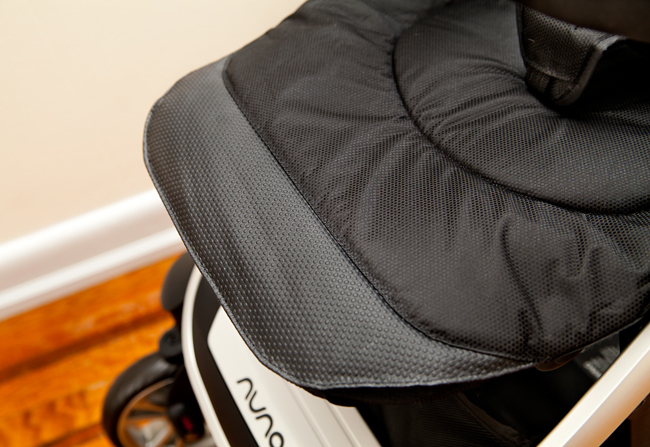 Edge of seat to foot rest - 8"
The seat on the Nuna Tavo is very spacious and comfortable. It features a one hand, four position recline, including completely flat. The stroller comes with a removable soft infant insert, making the seat plush and cozy for tiny riders. There's an adjustable leg rest with a rubberized, easy to clean edge. It adjusts to 3 positions; down, extended and up. When the seat is reclined and the leg rest is extended, the Tavo transforms into a flat bed, perfect for comfy naps! Another really cool feature of this leg rest is that it has little tabs tucked away in pockets on the reverse side. 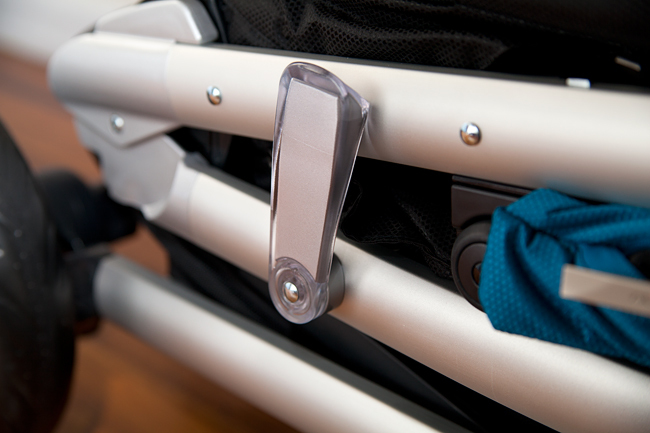 When pulled out, these tabs snap into the sides of the stroller, creating a closed-in infant bassinet. Tavo comes with a fabric covered bumper. Unfortunately, this bumper bar does not have gate opening and doesn't swing away like the bumper bar on the Nuna MIXX, but it is easily removable. Of course I'd rather have this type of bumper bar than none at all. I've tested the stroller out with 11 months old Little Missy and soon-to-be 3 year old Ben. Both were very comfortable in the seat with plenty of room to spare width-wise. The seat back on the Tavo is slightly shorter than on the MIXX (1.5" difference), and I think Ben pretty much reached the height limit for the seat, However he can still ride in this stroller comfortably because the seat to canopy measurement is 26" and the canopy is not sitting on his head. For reference, Ben is 36" inches tall. I do love how roomy the seat is! 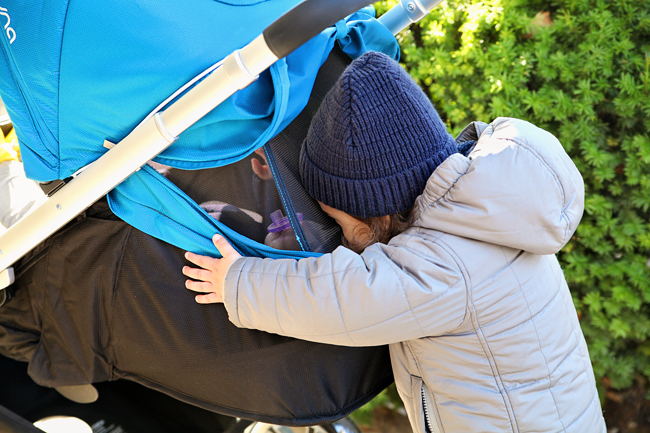 Some strollers with smaller seats fit children well in the Summer, but comes Winter + extra layers + foot muff and suddenly those strollers are not so roomy after all. I think the Tavo's generous seat will be perfect in all seasons. There's an integrated plastic toddler foot rest on the bottom of the stroller. It's wide enough for a child to rest his feet comfortably and also makes it easy for a toddler to climb into the stroller on his own. The seat and canopy fabric has a "bumpy" textures and looks attractive with a subtle sheen. 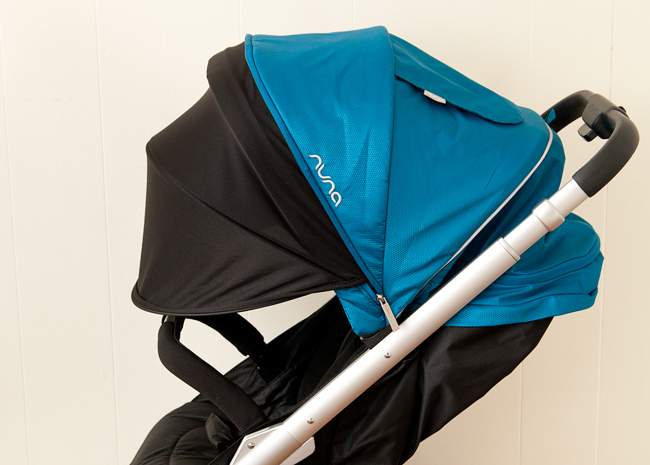 It is not as luxurious or soft as on the Nuna MIXX, and is somewhat noisy. On the plus side, it is quite durable and easy to wipe clean. The infant insert (which by the way is just as comfortable for toddlers) adds extra cushioning and resembles closely the fabric on the MIXX. It is a ribbed knit fabric and feels very soft. The insert is removable and washable, but the rest of the seat has to be wiped clean. Nuna make awesome canopies! 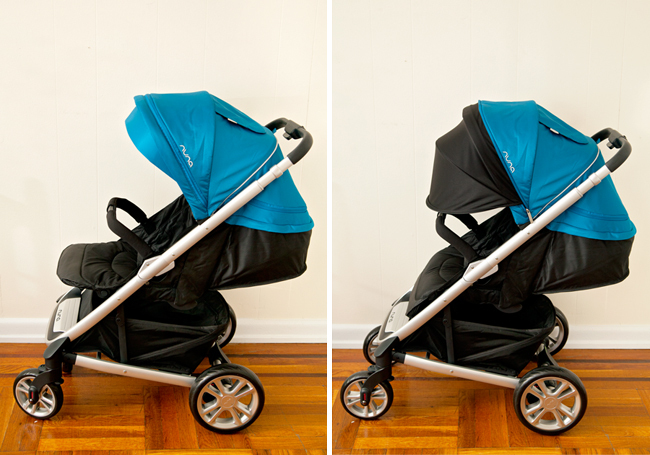 I like the canopies on all Nuna strollers because they are so well thought through and have features that most stroller brands lack. The canopy on the Tavo is no exception. It is large and has a flip-out eyeshade. There's also a 'Dream Drape' tucked away in a zipper compartment. It's made of breathable soft black material and when pulled out, reaches all the way down to the bumper bar. There's a large mesh peek-a-boo window with magnetic closure on top of the canopy. 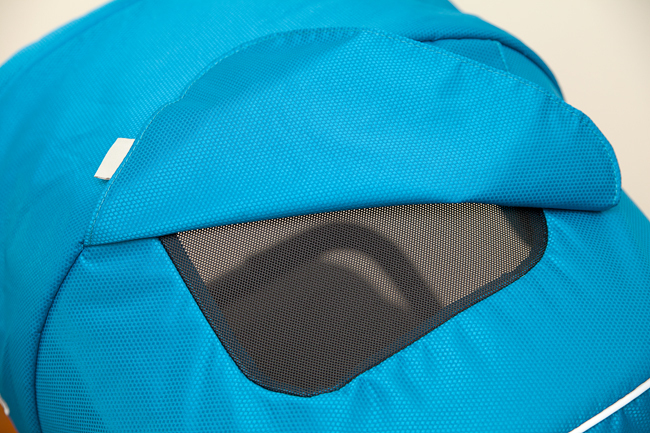 The back of the canopy zips away to reveal another black mesh insert. When opened, this insert will help with ventilation on a hot day. As I mentioned before, the Tavo was smartly designed to perform in all seasons! The canopy also has white reflective piping for safe night-time strolls. 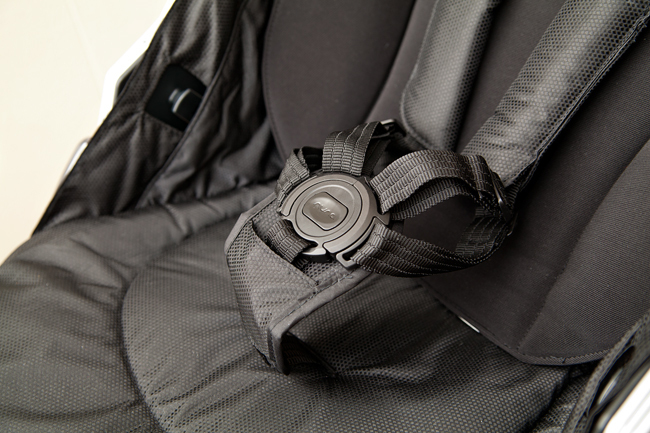 The anti-loop harness on this stroller can be used as a 3 or 5 point harness. The clip is really simple and intuitive and has a quick release button. The harness is quite long and will fit well over Winter layers. The Tavo is a really good push. I mean RALLY good. 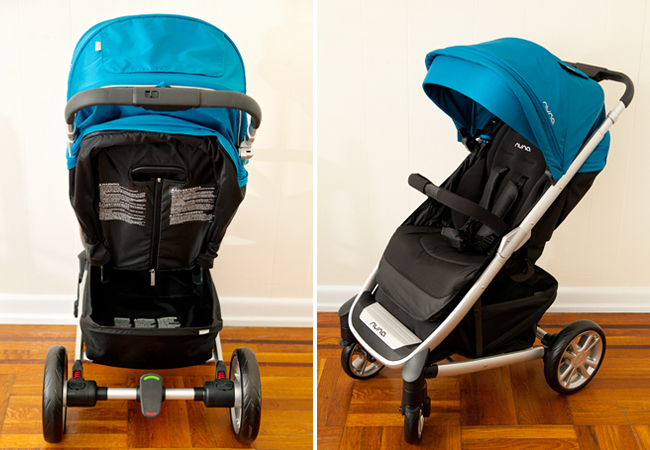 I always notice right away if a stroller is sluggish or hard to steer and the Tavo really exceeded my expectations. I steered it effortlessly with one hand. This stroller has curb pop! Pressing down on the handlebar really does raise the front wheels. Even with Ben in the stroller I was able to 'pop' up on a curb effortlessly. I can't tell you how happy this makes me! 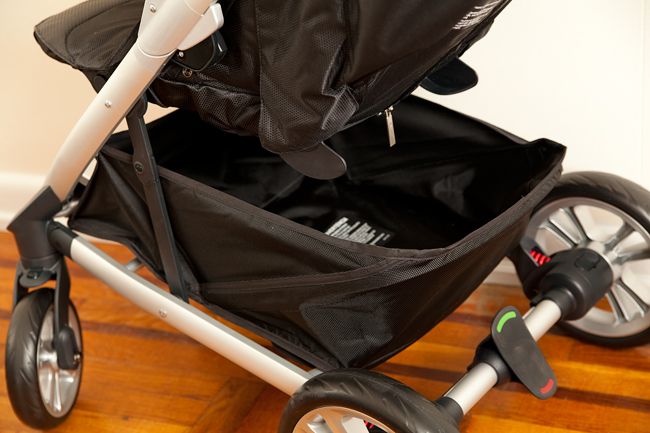 The stroller is equipped with front and rear wheel progressive suspension which absorbs those pesky bumps. I really felt the suspension cushioning the ride when pushing the stroller. 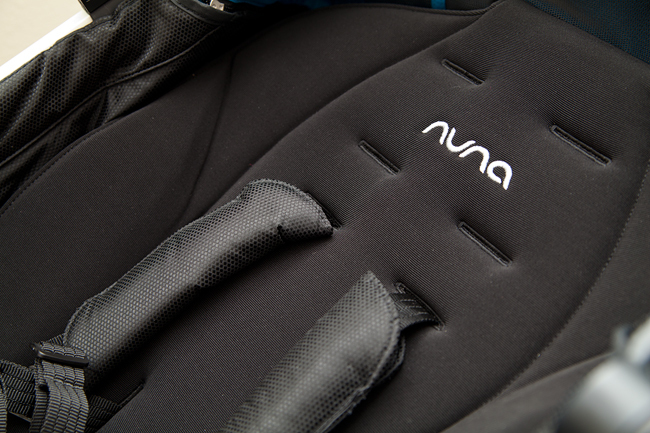 Nuna is proud of their suspension technology and made the springs red so you won't miss them. The wheels are made of foam. They are not all-terrain, but can handle grass and dirt roads. The front swivel wheels are lockable and all wheels are quick-release for a more compact storage. The telescopic handlebar is height adjustable. What makes it really special is the mechanism by which the handlebar is extended or lowered. You don't need to open and close two clips on either side as in so many other strollers. The handlebar is adjusted in one move. There are two inconspicuous little grips on either side. Pull them up simultaneously and raise or lower the bar as need. It may sound confusing in theory, but trust me, in practice it is so much simpler and faster than the 'old fashioned' way. As you can see, the storage basket on the Tavo is HUGE! It's wide and deep and will hold lots of baby essentials or groceries. I love a roomy basket, as I'm always dragging tons of stuff on our outings. This basket would fit it all and then some! The basket is easy to access when the seat is in the upright position. There's also a zipper compartment for storing little things that you'd want to keep separate. The Tavo fold is excellent! It is a one-step, one-hand fold. All you need to do is press and hold the button on the handlebar and the stroller collapses. 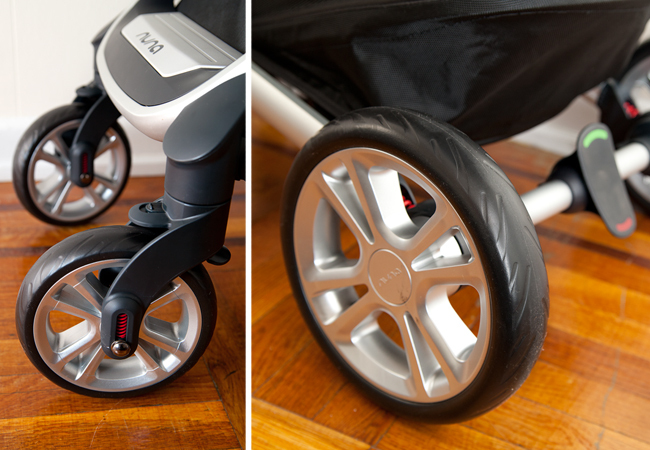 When folded, the stroller rests on it's wheels and can be rolled along on the large rear wheels like luggage. There's a folding lock which is not automatic, but very convenient. 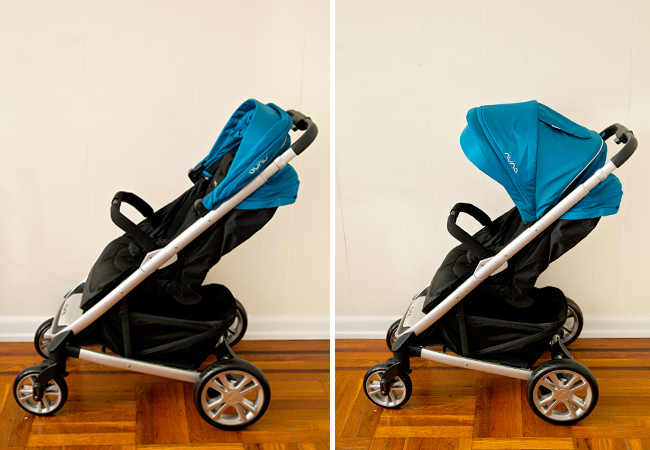 Opening the stroller is as simple as pulling up on the handlebar with one hand. The break is a truly flip-flop friendly! It's responsive and easy to engage and there's no need for lifting it. Just press on the red side to lock the rear wheels or press on the green side to release. It's large enough not to have to fumble for it, but not so large to be intrusive. 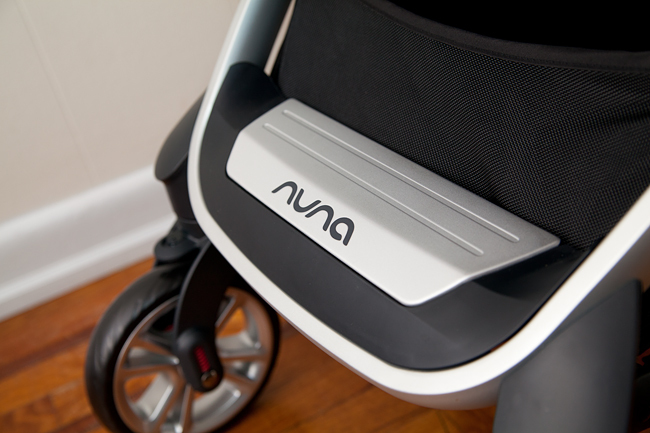 The Nuna Tavo is a really awesome stroller! Being as picky as I am, I'm really hard-pressed to find any fault with it. This stroller really checks all my "must haves". Baby comfort - excellent! Push and steering - excellent! Fold - perfect! 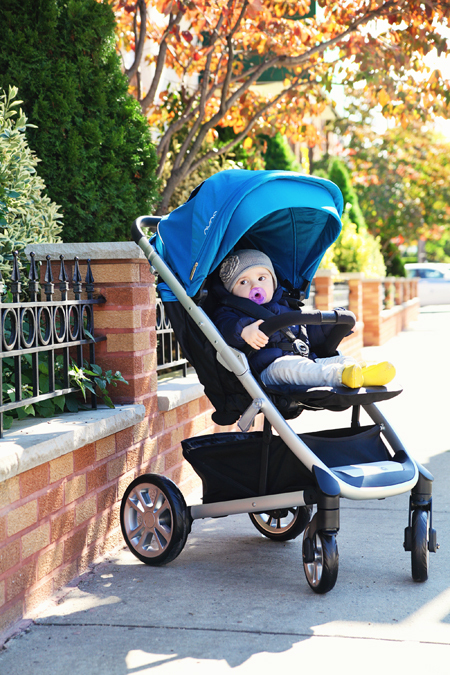 Tavo is a smartly designed mid-size stroller that is really great to push around the city and for mild terrain excursions. 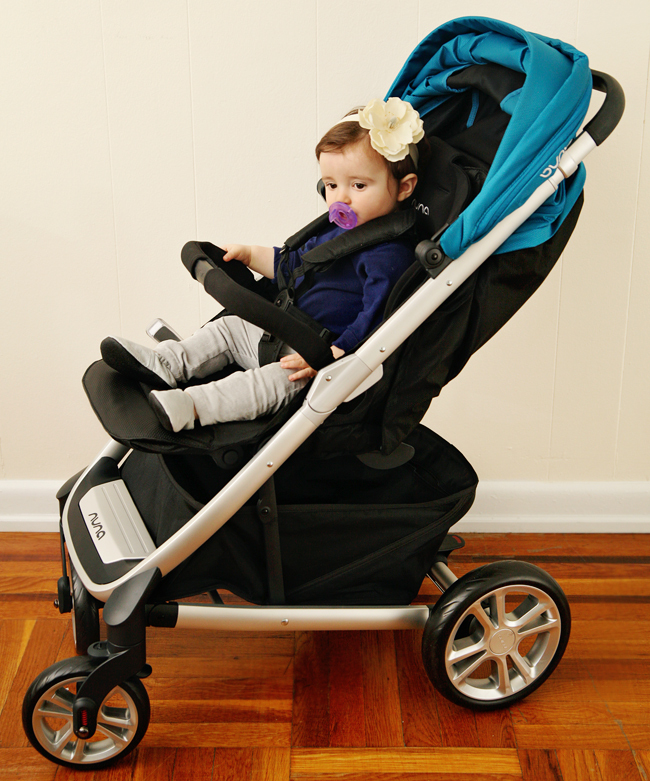 It is very sturdy and secure, infant friendly and travel system compatible. The seat is roomy and the stroller has plenty of storage space. 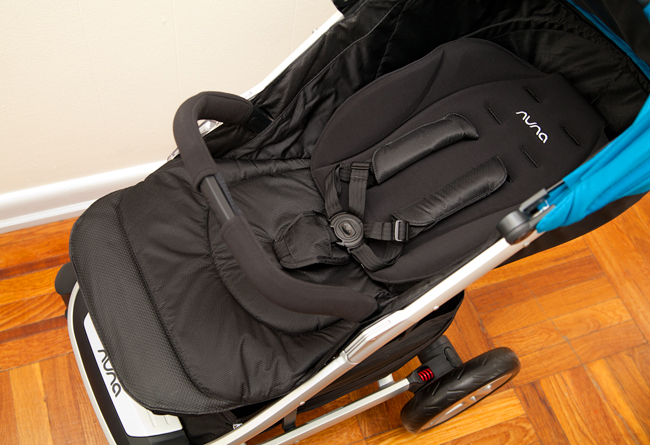 After considering all that this stroller has to offer, and putting it to the test with the help of my little stroller connoisseurs, I've decided to give the Nuna Tavo a 5 out of 5 stars rating! While the Tavo has a few really minor cons, I feel that overall, this is one of the best strollers I've had the pleasure of pushing. I'd like to thank The Baby's Den, for providing a stroller for this review. As always, all the opinions are entirely my own. Hi, thanks for your detailed review. 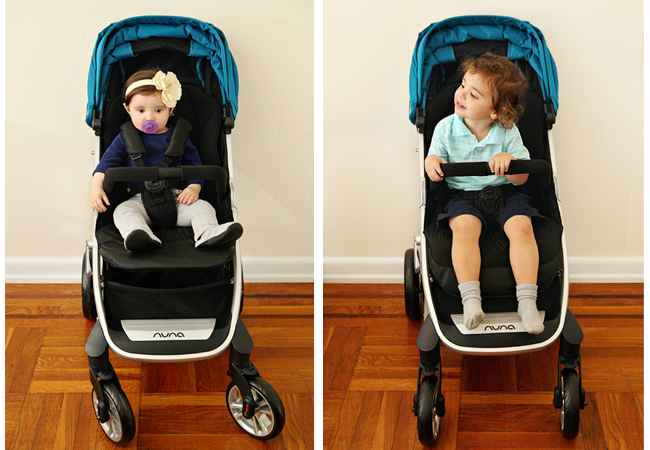 We have pretty much decided on getting a PIPA car seat so are wondering whether to get a Mixx or Tavo to go with. I like the Tavo's one-hand fold and the price point is really attractive. Since I am expecting my first child, I'm not really sure if rear facing is important. We plan to use the PIPA as a travel system as long as we can still carry the baby in the PIPA. We also looked at Cruz and Vista but I don't like how the recline makes the legs pop up. Do you find this a drawback in actual usage? Thanks in advance. Both strollers have their advantages. While I like the reversible seat on the MIXX, I think the Tavo has a better push. 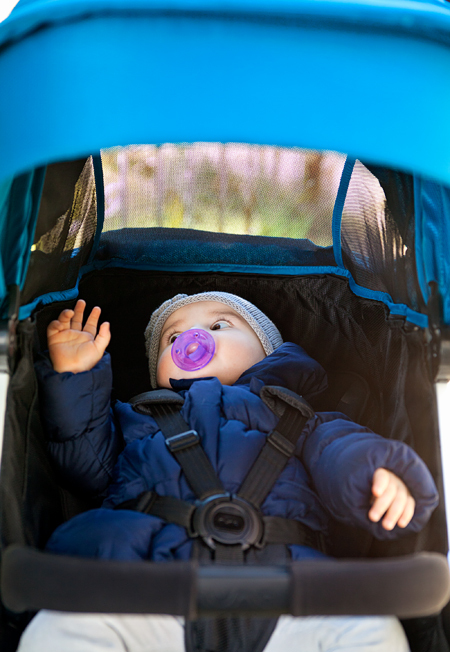 In regards to rear facing, infants generally feel more secure when they can make eye contact with parents while in the stroller, but if you plan on using the PIPA as a travel system, you will be facing your child for the first few months. Regarding the Vista and Cruz, while both have their advantages, I am really not a fan of "bucket seats". Many people are very happy with both these strollers, but I prefer a true-flat recline in a stroller. Hope this helps and good luck with your choice! Hi Sophie, thanks for the quick reply. I noticed the handle on the Tavo jiggles a little when set at higher positions, kind of like what you mentioned on the Mixx. Another thing we noticed on Tavo in store is if the handle is at lowest position AND the canopy is completely folded, the canopy touches your hand on the handle. One of our friends recommends Peg Perego Book Plus. We don't have local stores which have showing of this stroller so can't really test it out. The only possible issue I see with it is the max weight at 45lb. He has a petite baby girl but our baby is already ahead of schedule in size according to ultrasound measurement. Have you had experience with the Book Plus? Thanks again. The jiggling of the extended handlebar which you've mentioned is actually very common and I've learned to ignore it if the stroller otherwise fits my needs. The Book Plus is a very nice stroller but it does have some drawbacks. The seat back is not very tall and the stroller is bulky when folded. Please send me an e-mail and I'll respond with more info. Thanks! quick question. 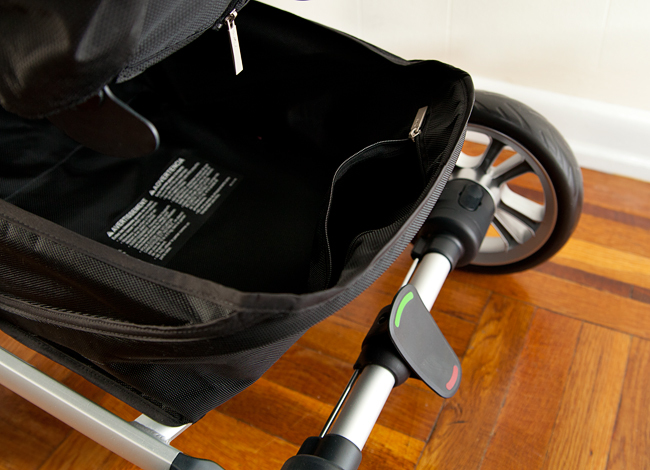 do you find that the seat in the Tavo, when pushed all the way upright, is truly upright for your toddler? We have a city mini gt and thinking about getting the Tavo. He slouches in the city mini and I think it makes him less tolerant of being in stroller. Do you feel like its a true upright seated position? THanks! The seat is not perfectly upright, but it's reinforced, so it provides good back support. I don't remember if the seat in the City Mini is soft or rigid? Maybe if the seat is soft, it contributes to your son's slouching? Also having an adjustable leg rest helps with comfort and stroller tolerance. Hi! Can you please tell me the seat depth with the calf support raised? My son only likes sitting in strollers with the rest up because he hates having his dangling. 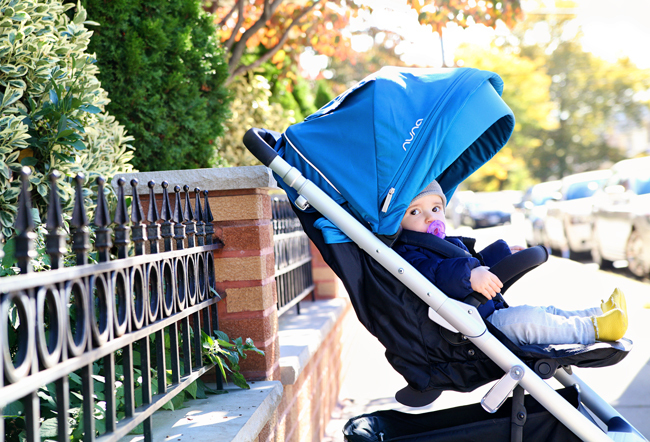 As far as seat size goes and room to grow, do you think the tavo is more spacious and more toddler friendly than the mixx? I had the mixx when it first came out and loved it but the seat seemed way too snug for my son who was 1.5 at the time. Now that I have another baby on the way I would like a Nuna travel system but I'm worried about seat size! Thank you! I don't have the stroller anymore (can't keep them all), so I can't get you that measurement. The seat depth is 10" and my estimate is that the leg rest adds about 5-6 inches. I do think the Tavo is more toddler friendly than the MIXX, although the seat back on the MIXX is slightly longer.